Before the Summit Hill apartment building can go up, Salem Baptist Church and its associated buildings must come down. Part of that complex includes a former dairy building that is not only adjacent to Jenkintown Borough Hall, it’s literally holding it up. For reasons lost to time, Jenkintown Borough was allowed to use this neighboring building to hold up the roof of its new hall. The new bunker-like building that no one seems to like replaced a quainter and smaller structure located at the corner of West and Leedom. That property was transferred to Immaculate Conception Church which today uses it for parking and a small playground for its day care program. The demolition crew will need to remove much of the second story wall by hand to avoid bricks falling onto the roof of Borough Hall — or worse. 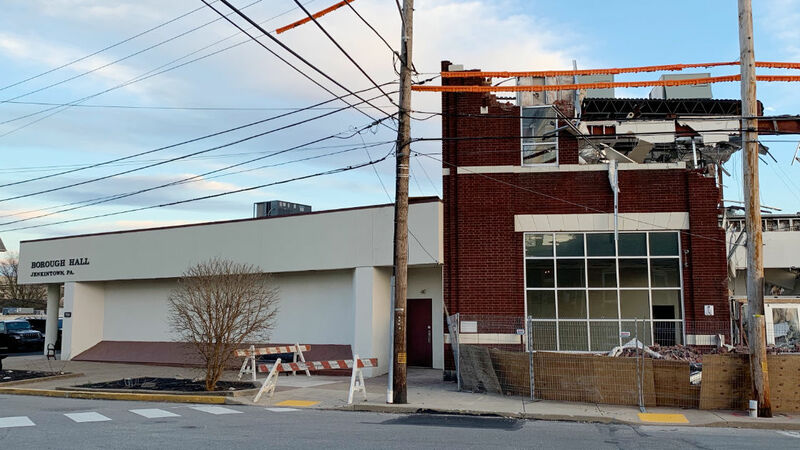 The Borough has expressed an interest in selling its properties at 700 Summit Avenue and move to a new space somewhere else in the Borough.